Within a three day span, U.S. Bellows, Inc., the expansion joint division of Piping Technology & Products, Inc., fabricated a 40 I.D., single coded, clamshell expansion joint for a chemical plant in Beaumont, Texas. 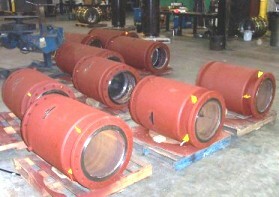 The chemical company utilized U.S. Bellows’ 24 x 7 Quick Turn/Emergency service. After the representative from the chemical plant completed the online form, the U.S Bellows’ on-call team was immediately paged. 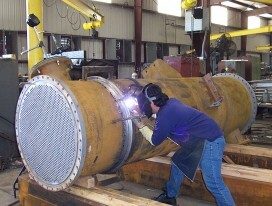 Three days later the bellow had been successfully fabricated, welded to an A516-70 heat exchanger shell and shipped to the chemical plant to resume operation. The bellow was fabricated from A240 tp 321SS and designed at 50 PSIG and 750oF. In order to detect any leaks in the weld, the bellow’s long seam weld was 100% x-rayed and its attachment weld was 100% dye-penetrant. 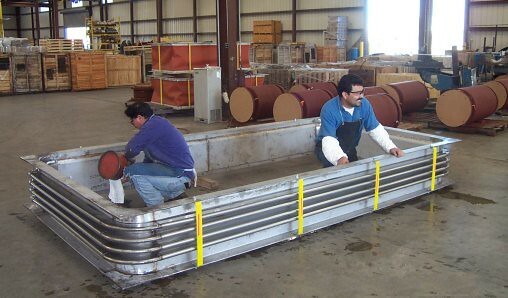 U.S. Bellows, Inc., the expansion joint division of Piping Technology & Products, Inc., designed and fabricated a 71 x 143 rectangular expansion joint for an oil refinery in India. 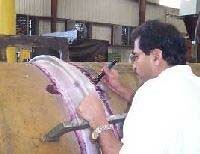 The expansion joint was fabricated from SS 316 L, designed at 18 psig at 417°F. It is equipped with a liner and rounded corner bellows design. EJMA Standards and B31.3 code were used in the design and fabrication of this joint.